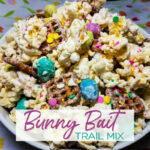 A snack lover's dream, Bunny Bait Trail Mix is a blend of popcorn, pretzels, 2 kinds of chocolate and...sprinkles. Everything is better with sprinkles! Line a baking sheet pan with parchment paper & set aside for later use. Cook the microwave popcorn according to package directions. Allow to cool slightly, then carefully remove & throw away any unpopped kernels. Using a large bowl, combine the popped corn, pretzels and M&Ms. Place 4 Vanilla flavored candy coating bars in a microwave safe bowl. Microwave the bars for 30 second intervals, stirring after each 30 second interval, until melted. Pour the melted candy coating over the popcorn mixture and stir gently until evenly coated. Quickly transfer the candy mixture to the prepared sheet pan and add the colored sprinkles before the chocolate hardens. Allow the snack mix to set up for 20 minutes. Break into smaller pieces and store in a tightly sealed container on the counter. The mix will keep for about 5 days. Change the candies and colors to make this festive mix for other holidays.